Ashok Leyland, flagship of the Hinduja Group, and one of the largest commercial vehicle manufacturers in India, launched Captain Haulage and 3718 Plus, the BS-IV trucks with iEGR (Intelligent Exhaust Gas Recirculation) engines in Bengaluru today. Ashok Leyland also introduced Haulage Trucks with maintenance free Hubs i.e., with Unitized Wheel Bearings. 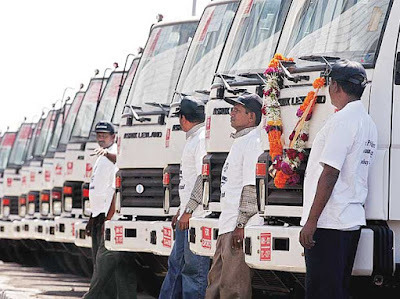 The Captain Haulage trucks are especially designed to deliver higher uptime and faster turnaround time to meet the high productivity demands of the logistics industry. Captain is powered by the H series CRS engine with iEGR technology, and offers high initial pickup, superior driveability and unmatched fuel economy. With international styling and comfort and designed for the Indian operating conditions, the Captain offers the best-in-class cabin which is available in both AC and non AC versions. These vehicles also come with an essential safety feature, Frontal Crash Protection. This feature helps the vehicle to absorb the impact in case of an unfortunate incident of head-on collision and keeps the occupants of the vehicle safe. Captain Haulage Trucks are available in 25T, 31T & 37T GVW segments. The range is built for a wide number of applications like Market Load, Parcel, Tankers, Cement Bulkers and Containers. 3718 PLUS is latest addition in 37T segment which is one of the fastest growing segments in CV industry. This offers another 10% fuel savings, 225 kgs of more payload and 10% extra tyre life from new technology tyres. 3718 PLUS offer the best maneuverability through optimal overall length, 27.5 ft & 29.5 ft loading span options, and appropriate positioning of lift axle. In Trucks with Unitized Wheel Bearings, grease is packed for life and no periodical hub greasing, end play adjustment or bearing replacement are required. It also helps in improving tyre life. Unitized Wheel Bearings are now available as an optional feature on 37T & 31T range and will expanded to other ranges progressively.